The other day I was peeling the sticker off a beautiful, organic red pepper that I was about to add to my salad and noticed it said grown in Holland. I don’t know why this struck me more than bananas from Ecuador or avocados from Mexico, maybe I’ve just become accustomed to seeing those names, but Holland really got me thinking. Do I need to be eating a pepper that has travelled half way around the world to get to my plate? This can’t be good for the environment or our local economy, not to mention it’s now summer and the farmer’s market is open and filled with tons of local vendors with seasonal fruits and vegetables just waiting to be taken home and crafted into gorgeous, colorful summer meals. Here are 8 reasons why you should hop on the local, seasonal train this summer! Support Your Local Economy- Buying locally supports farmers in your area who believe in sustainable food systems, keeping food affordable, accessible, and free of nasty chemicals and pesticides. It allows local farmers to make a living and be able to keep growing nutritious food for their communities. Farming is extremely hard work, and at the moment, not very lucrative for the average family farmer that is competing with big agro businesses pumping out high yield, nutrient-poor, and often cheaper products year-round. By purchasing locally, you will help keep the money in the hands of local farmers, allowing them to continue to produce sustainable, diverse in your area. Better nutrition- The minute that fruits and vegetables are harvested they begin to lose nutrient density. Mass-produced, mega-farmed crops already nutritionally pale in comparison to their local, organic counterparts due to soil quality alone let alone the time they spend in transit. On average, our fruits and vegetables travel 1,300-2,000 miles from farm to table and it can be up to two weeks before they are consumed. For example, spinach and green beans lose two-thirds of their vitamin C within a week of harvest, according to the University of California, Davis. A University of Texas study also found “reliable declines” in the amount of protein, calcium, phosphorus, iron, riboflavin (vitamin B2) and vitamin C in 43 different vegetables and fruits over the past half century. If you hit up your local farmers market, the produce was most likely picked a day or two earlier and grown in soil rich in vitamins and minerals that boost the nutrient content of your food. Flavor- Ever tasted a cherry tomato fresh off the vine, ripened to perfection in the summer sun? Tell me you wouldn’t choose that hands-down (Every. Single. Time) over a store-bought container! Seasonal produce is grown in exactly the environment that it was designed to be grown. Growing produce out-of-season requires manipulation to the environment or to the genetic make-up of the produce itself. This creates longer shelf-life, travel time, and mass-production which results in flavor that will never compare to fresh, local, in-season fruits and veggies that are ripened to perfection in their natural environment just as they were intended. Health Benefits- The natural cycle of produce is perfectly designed to support our health needs as the seasons change. In the spring, fresh leafy greens help us detox and loose some extra pounds after a long winter of comfort foods. In the summer, to stay cool and hydrated, we should eat more fruits, berries, cucumber, and watermelon which are bountiful. As winter hits and colds and flus are plenty, winter squash are available loaded with immune-boosting antioxidants such as beta-carotene and vitamin C. Embracing seasonal food facilitates the body’s natural healing processes. Environment- The carbon footprint of world food travel is not a small one. Today, the typical American prepared meal contains, on average, ingredients from at least five countries outside the United States. The Natural Resources Defense Council analyzed the transportation-related impacts of importing agricultural products into California and found that in 2005 alone, almost 250,000 tons of global warming gases, 6,000 tons of smog-forming nitrogen oxides, and 300 tons of sooty particulate matter were released into the air- the equivalent of almost 3 million vehicles on the road or 318 power plants! And that’s just one year in California alone! On the flip side, a study showed that when you combined all locally grown food, it still produced less carbon dioxide emissions in transport than any one imported product. If that alone doesn’t convince you to start buying locally, then I’m not sure what will! 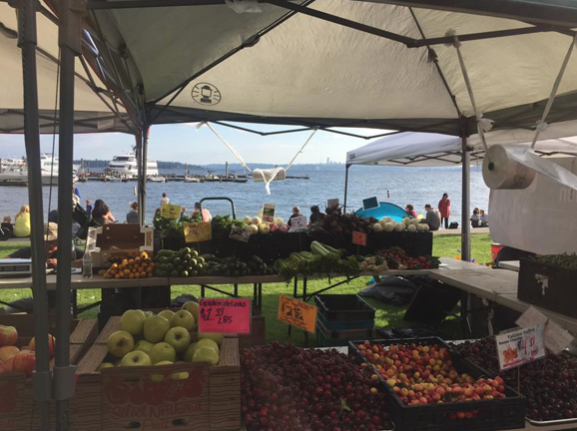 Community- Farmers markets are filled with people from your community participating in a wonderful process of getting to know where their food is coming from, who is growing it, and how the whole process works from farm to table. CSA’s (Community Supported Agriculture) and farmers markets create communities around food that encourage us to ask questions, share knowledge, and engage in our local environment. Communities can unite and be a powerful force to help change our food systems for the better! Kitchen Fun- Buying fresh, local whole-foods can be a great way to get in the kitchen and experiment with fun, seasonal, home-cooked meals. Head to your farmers market or check out what’s new in your CSA box and use those fresh ingredients to make a delicious, new recipe you’ve been wanting to try. Cooking can be a fun way to connect with family and get everyone involved! Be Adventurous- Local, seasonal foods can mean finding things you don’t normally see at the grocery store. Be brave and buy some things you’ve never tried before, you might be pleasantly surprised at the flavors and variety you can add to your cooking. 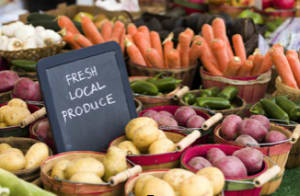 Leave a comment below and let me know what some of your favorite items are to buy at the local farmers market.